Following yesterday's look at the brief, but memorable, period of the Russian Penguins, Part 2 today looks at the aftermath following the Pittsburgh Penguins withdrawal of support of CSKA Moscow and the subsequent fallout over the next seven seasons. After dominating the world of Soviet ice hockey from 1946 through 1989, which included all but six championships from 1955 to 1898 and 13 consecutive from 1977 to 1989, the Central Sports Club of the Army (CSKA Moscow) saw it's advantage begin to erode when, first, some of their older star players were allowed to leave for the riches of the NHL (in a not so transparent effort to generate some much needed income), followed by key defections of prime up and coming talent. Their situation nose dived with the breakup of the Soviet Union and their subsequent loss of government backing. By the time the International Hockey League replaced the former Soviet Championship League for the 1992-93 season, Central Red Army (CSKA Moscow) plummeted to an overall record of 9-42-11 and a last place finish in the 12 team Western Conference. How the mighty had fallen. With the Russian Department of Defense no longer able to fund the team, 1993-94 saw a new partnership with the recent back-to-back Stanley Cup champion Pittsburgh Penguins, which resulted in a new logo and North American marketing savvy brought on board in order to bring in new sponsorships to revitalize the team. The renewed efforts on behalf of the club paid off with a 21-20-5 record that saw CSKA Moscow rise to 14th place out of 24 and a return to the playoffs. 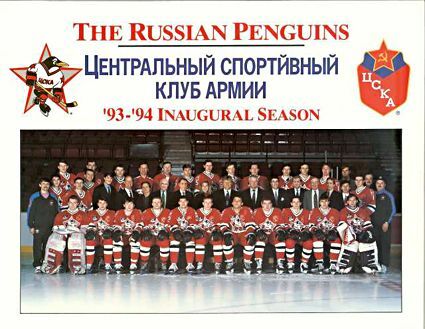 1994-95 had the Russian Penguins finish with a winning record at 25-20-7 and another playoff appearance. But it also signaled the end of the Pittsburgh organization's involvement (as we detailed yesterday) as the Russians now felt they could run the show on their own. Motivated by greed, team management wanted to keep all the anticipated sponsorship dollars for themselves, without having to split it 50/50 with the North Americans any longer. They were also delusional to think they could retain the sponsors brought in by the Pittsburgh marketing staff in light of the interference in their operations suffered at the hands of the Russian Mafia, who went so far as to kick the team's sponsors out of the arena's luxury boxes as well as being responsible for the deaths of as many as three of the team's staff! Predictably, CSKA Moscow fell to 8-13-5 in the first round of the 1995-96 season, finishing 11th out of 14 teams in the Western Conference. For the second round of the season, they were grouped with the other non-automatic playoff qualifiers and faired well, finishing atop the group comprised of the lower half of the league with a 19-4-3, earning one of the two available playoff spots as the 15th seed. Their reward for their efforts was drawing long time rivals and 2nd seed Dynamo Moscow, who eliminated CSKA Moscow 2 games to 1. 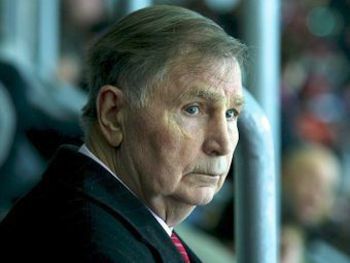 The upheaval following the 1995-96 season was seismic, as the team found itself barred from their facilities, the water and electricity shut off and the long time and highly decorated Viktor Tikhonov out as head coach of CSKA Moscow, the team he led with an iron fist since 1977. Tikhonov responded by forming a new club, the incredibly similarly named HC CSKA Moscow and taking his case to court, where the actions of Colonel Alexander Baranovsky in ousting Tikhonov were found to be illegal. Tikhonov's new club were granted access to the arena, but order was not necessarily restored, as locks were cut off lockers, electricity, water and phones were cut off and access to the training base was blocked. The upheaval cost both Tikhonov's new club and the existing CSKA Moscow team much needed players, as they did not want to be caught in the middle of the fight between Tikhonov and the army and opted to play elsewhere. The situation became even more muddled when the established CSKA Moscow found itself relegated to the Yysshaya Liga, the second level of Russian hockey, for the 1996-97 season. 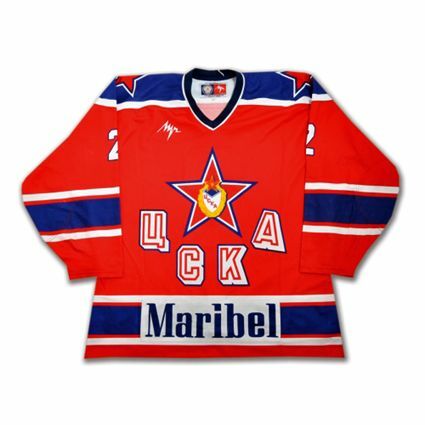 The established club opted to return to the classic "UCKA" lettering underneath a red star on the front of their jerseys, while Tikhonov's upstart operation stayed with the Russian Penguins logo and joined the newly formed Russian Superleague, meaning the old guard and former dominant powerhouse team, CSKA Moscow, was in the formerly unfathomable position of playing in the second division, while Tikhonov's upstart "Red Army" club (HC CSKA Moscow) started out life in the top division! CSKA Moscow fared well in 1996-97, winning promotion by finishing first in the Western Conference of the Vysshaya Liga, while Tikhonov's HC CSKA Moscow was a first round playoff exit. This set up an even more confusing situation for the 1997-98, as the new HC CSKA Moscow and the established CSKA Moscow were now both competing in the Russian Superleague at the same time. One can only imagine the difficulty broadcasters and reporters must have had when the two Red Army clubs met during the course of the regular season and the intensity the games must have had during this Civil War of Red Army vs. Red Army! The established CSKA Moscow side finished 8th in the Western Conference while Tikhonov's HC CSKA Moscow side came 12th out of 14. CSKA Moscow missed out on the Superleague playoffs, while HC CSKA Moscow failed to survive the relegation schedule and was demoted to the Vysshaya Liga for 1998-99, separating the two clubs once again. Clear as mud, right? For the next three seasons Tikhonov's HC CSKA Moscow side finished mid-pack in the Yysshaya Liga, but a strong 2001-02 season saw them earn a promotion back to the Russian Superleague by finishing with a combined 49-12 record with 1 overtime win, 6 ties and 2 overtime losses over the course of the two halves of the split season. Meanwhile, CSKA Moscow soldiered on in the Superleague, managing to avoid relegation by the barest of margins, winning a tiebreaker over Vityaz Podolsk in 2000-01 to avoid the drop, but the 2001-02 season saw them slip to depths of a new level, as they completed a dismal season at 10-36-4 with an overtime win to finish 17th out of 18, a single point out of last place for the once mighty Red Army, but not enough to avoid relegation to the Vysshaya Liga for 2002-03, an especially bitter pill considering Tikhonov's HC CSKA team were to be promoted into the very spot they were vacating. Eventually, after several failed attempts over the years, the reality of the situation finally was too much for all involved to continue to deny - one strong CSKA club was a far better and more commercially viable option than two mediocre, financially struggling teams. An agreement was finally reached, which included Tikhonov at the helm of the reunited club, which would use HC CSKA's spot in the Superleague for the upcoming 2002-03 season. The merger also signaled and end of the "Russian Penguins" logo, which far outlived it's intended purpose as the logo for the joint effort between the Pittsburgh Penguins and the Central Sports Club of the Army, an arrangement which came to an end seven years prior. The reunited CSKA Moscow rose as high as third in 2007-08, the final Superleague season, and won division titles in the Tarasov Division of the Kontinental Hockey League, in 2008-09 and 2012-13. In 2014-15, CSKA not only won the Tarasov Division, but finished with the best record in the KHL with 139 points from a stellar 49-9-1-1 record, 16 clear of traditional rivals Dynamo Moscow and SKA Saint Petersburg, only to lose in the Conference Finals to Saint Petersburg in seven games. In 2015-16, CSKA repeated as the regular season champions with a 43-14-1-2 mark for 127 points. For the first time while a member of the KHL, the club advanced to the Gagarin Cup Finals, winning 12 of 13 games in the process, only to lose Game 7 to Metallurg Magnitogorsk 3-1 to deny CSKA their first championship since the fall of the Soviet Union. 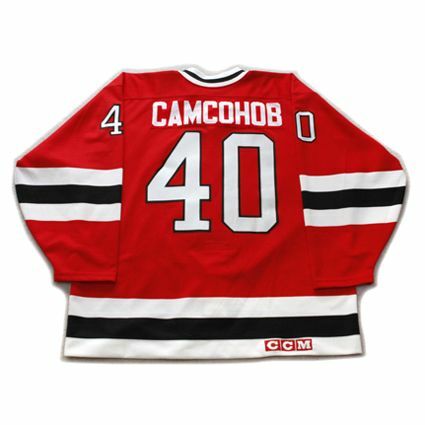 Today's featured jersey is a 1995-96 HC CSKA Moscow Sergei Samsonov jersey. Tikhonov's Red Army club continued to use the Russian Penguins logo, only now with the Cyrillic characters "XK" added to the chest of the penguin to differentiate it from CSKA Moscow, while the original club used the classic UCKA crest below the red star. Samsonov played two seasons for CSKA Moscow but left Russia for the North American minor leagues amidst all the strife surrounding the two warring Red Army clubs, choosing instead to play for the Detroit Vipers of the IHL. Following the 1996-97 season, he was drafted 8th overall by the Boston Bruins and would go on to play eight seasons with Boston before bouncing around the NHL, with stops in Edmonton, Montreal and Chicago before settling in with the Carolina Hurricanes for four seasons before wrapping up his career with 20 games with Florida in 2010-11. He would play 888 games, score 235 goals and 571 points, reaching Game 7 of the Stanley Cup Finals with Edmonton in 2006. Bonus jersey: Today's bonus jersey is a 1996-97 HC CSKA Moscow Alexei Kasatonov jersey. 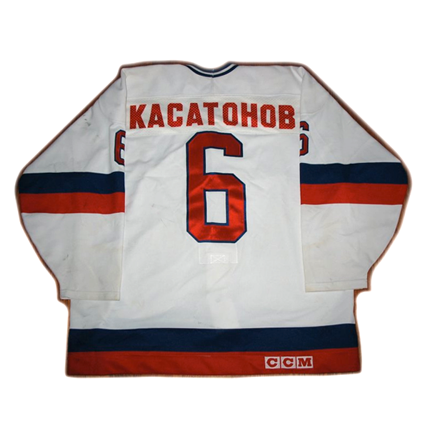 This jersey is from Kasatonov's final season when he returned to Russia following the conclusion of his NHL career. Note the name on the back in Cyrillic lettering. 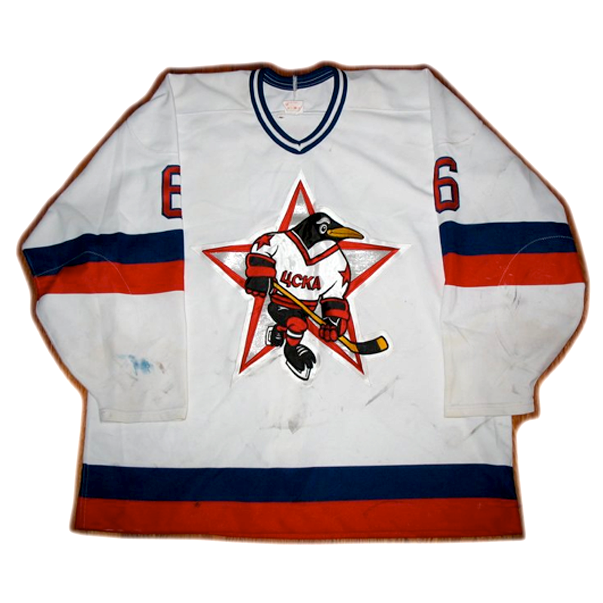 While the original CSKA Moscow "Red Army" club returned to their previous star logo, the upstart new HC CSKA Moscow adopted the "Russian Penguin" identity as their own, creating much confusion among jersey collectors, as the Penguin logo was used for eight consecutive seasons, but by two separate, but nearly identically named clubs. 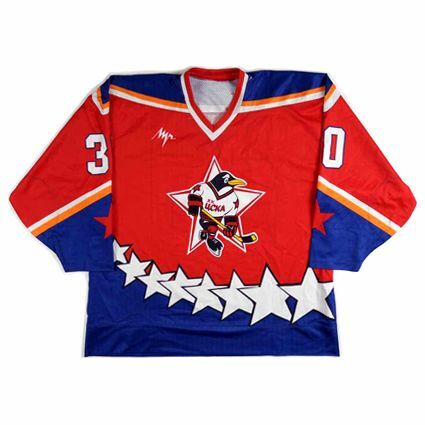 The CSKA Moscow "Russian Penguins" jerseys were red with black and white trim. 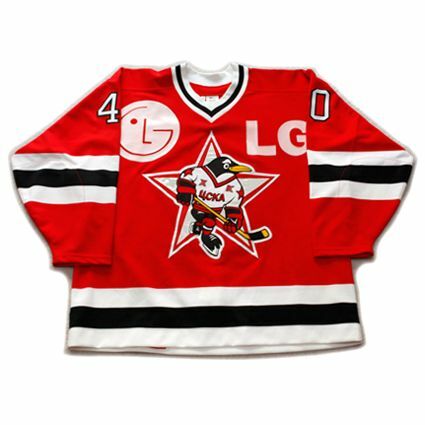 The HC CSKA Moscow "Russian Penguins" jerseys were also red with black and white trim with LG sponsorship and the letters XK (Cyrillic for HC to differentiate themselves from CSKA Moscow) added to the upper chest of the penguin logo before a change to red jerseys with blue and white trim as shown in today's bonus jersey. After six seasons of two separate "Red Army" clubs, they were merged for the 2002-03 season, bringing to an end the use of the Russian Penguins logo. 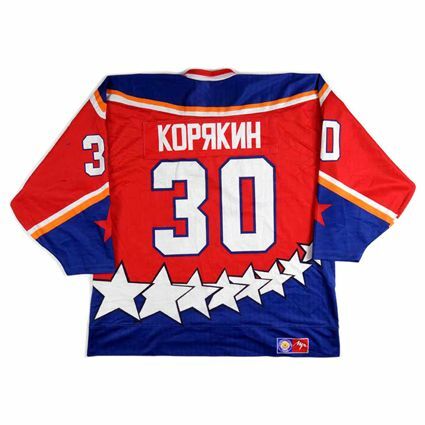 Extra bonus jersey: Today's bonus jersey is a 2001-02 HC CSKA Moscow Maxim Koryakin jersey as worn by Tikhonov's HC CSKA Moscow during their final season as an independent club, separate from the original CSKA Moscow team. HC CSKA, as denoted by their use of the Russian Penguins logo with the addition of the "XK" to the chest of the penguin in the logo to differentiate themselves from the CSKA Moscow club, would earn promotion from the Vysshaya Liga at the conclusion of the 2001-02 season. Their subsequent merger with the original CSKA Moscow team prior to the start of the 2002-03 season would bring to an end the use of the "Russian Penguins" logo, which lasted well beyond the two years of the operating agreement between CSKA Moscow and the Pittsburgh Penguins of the NHL. 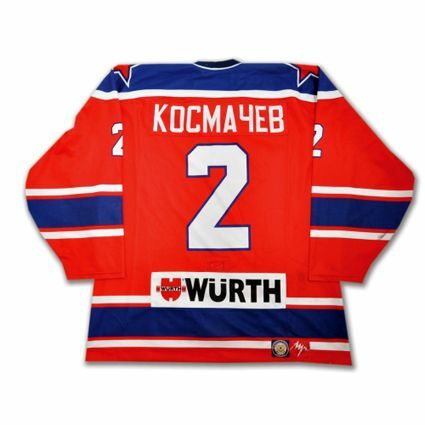 Extra extra bonus jersey: Today's extra bonus jersey is a 2002-03 CSKA Moscow Dimitri Kosmachev jersey as worn by the reunited CSKA Moscow team in the Russian Superleague, the first season the two rival Red Army clubs were merged into a single entity once more. Today's first video is a feature on a young Samsonov from 1994, which if you look closely during the interview, has the classic UCKA logo on the chest, with the Russian Penguin logo on Samsonov's left torso. Finally, CSKA Moscow lives on, now only in the KHL.